Lock in a great price for Holiday Inn Express - Colorado Springs - First & Main – rated 9.2 by recent guests! This is the 2nd time we have stayed at this hotel. I will stay here again. The staff was very friendly and helpful. The room was clean and comfortable and the location was great. The breakfast overall was filling, staff in the kitchen was very pleasant. I wanted to take the bed and pillows home with me! Extremely comfortable!!! Breakfast was great, rooms were spacious, beds comfortable, staff very nice. The staff was very friendly. The location is ideal for shopping. Facilities are nice. The hotel staff were absolutely amazing! Very helpful and accomodating. I got to check in early. Great selection of tv channels and great restaurants near by also a movie theater next door. Awesome. Drapes were lovely, worked properly, and blocked out the sunlight. Bed and pillows were comfy. TV functioned well. Everything was spotless. Tons of bath counter space. Hot shower with rain showerhead so appreciated. Housekeeping stayed out of my room -- thank you. Received my wake-up call as requested. 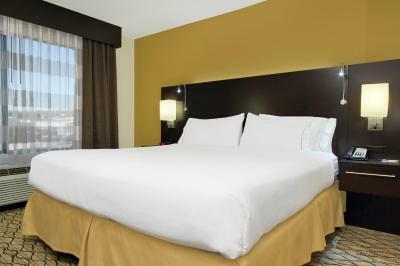 Holiday Inn Express - Colorado Springs - First & Main This rating is a reflection of how the property compares to the industry standard when it comes to price, facilities and services available. It's based on a self-evaluation by the property. Use this rating to help choose your stay! One of our top picks in Colorado Springs.Featuring an indoor heated pool, this hotel is 30 minutes’ drive from the United States Air Force Academy. All rooms include free Wi-Fi. A full hot breakfast buffet is served daily. Each room offers a work desk, a flat-screen TV with cable channels, a microwave, a small refrigerator and coffee-making facilities at Holiday Inn Express - Colorado Springs - First & Main. An private bathroom equipped with a hairdryer is also provided. 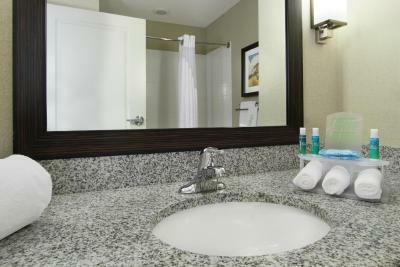 Guests can enjoy a fitness center and a business center at Holiday Inn Express - Colorado Springs - First & Main. Free parking is available on site. Garden of the Gods is 30 minutes’ drive from Holiday Inn Express - Colorado Springs - First & Main. Pikes Peak is 40 miles from the hotel. 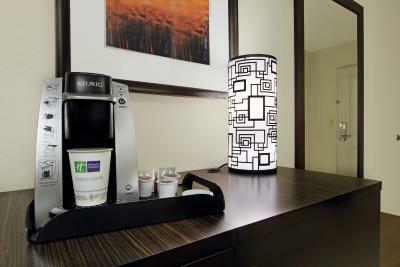 When would you like to stay at Holiday Inn Express - Colorado Springs - First & Main? This air-conditioned room features a work desk, a flat-screen cable TV, a microwave, a small refrigerator and coffee-making facilities. A private bathroom with a hairdryer is also included. Bed type is selected upon check-in. This air-conditioned room features a work desk, a sofa bed, 2 flat-screen cable TVs, a microwave, a small refrigerator and coffee-making facilities. A private bathroom with a hairdryer is also included. This twin room has a flat-screen TV and seating area. House Rules Holiday Inn Express - Colorado Springs - First & Main takes special requests – add in the next step! Holiday Inn Express - Colorado Springs - First &amp; Main accepts these cards and reserves the right to temporarily hold an amount prior to arrival. Holiday Inn Express - Colorado Springs - First & Main accepts these cards and reserves the right to temporarily hold an amount prior to arrival. Please note that roll-away beds are available in select rooms for an additional fee. Contact the property for more details. Please note that different policies may apply when booking 9+ rooms at the property. Contact the hotel directly for more information. I slipped and fell getting into the tub. There was no tub mat and the tub was very slippery. Very clean but no traction to stay standing. There was like a film of soap or bleach left in the tub to make it very slippery. There were no vegan breakfast choices other than two green bananas and a shriveled apple. Bed was a little harder than I like. No microwave oven in room. Exact same things for breakfast every morning. The sheets were very soft!! Breakfast was a problem each morning. Ran out of food. Raw biscuits, etc Only one elevator. Caused long waits.